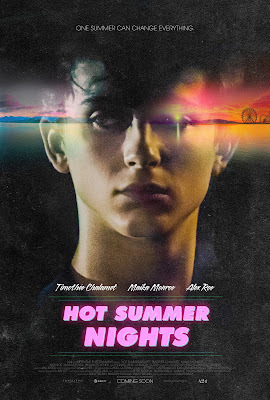 Set in Cape Cod over one scorching summer, Hot Summer Nights follows Daniel (Timothée Chalamet), a shy out-of-towner who gets in over his head flipping weed with the neighborhood rebel (Alex Roe) while pursuing his new business partner's enigmatic sister (Maika Monroe). With a hurricane looming in the wings, tensions rise against a backdrop of drive-ins, arcades, and crashed parties as the stakes (and temperatures) grow ever higher. Available exclusively on DIRECTV June 28. In Theaters July 27.